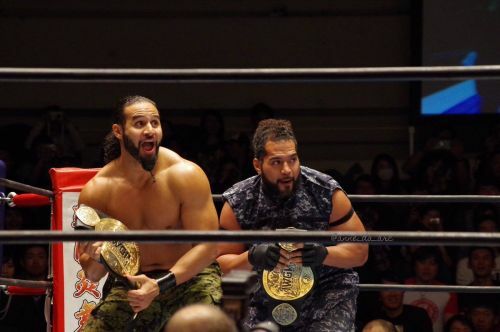 Over the past several weeks, The Bullet Club Firing Squad's Tama Tonga and Tanga Loa have been on a recruiting mission for the faction and have openly stated that they are looking to bring in fresh faces to The BC. As noted, both Tama and Tanga recently arrived at an NXT House Show, in order to scout the very best talents the WWE developmental talent. After having his issues with Bullet Club leader Kenny Omega throughout 2017, Tama Tonga and his fellow Tongan Brothers and their legendary father Haku finally put the entire Bullet Club Elite on notice at this year's NJPW: G1 Specials at the Cow Palace, San Fransisco. Tama, alongside Tanga Loa and Haku, put one of the most gruesome beatings of all time on The Bullet Club Elite at The Cow Palace, following Kenny Omega's successful IWGP Heavyweight Title defence against fellow stablemate Cody Rhodes. Shortly afterwards, it was revealed that the mastermind behind The Firing Squad's attack was non-other than Bullet Club OG, Bad Luck Fale, who had initially ordered the hit on The BC Elite. Tama Tonga, Tanga Loa, and Bad Luck Fale have all recently announced on social media that they are currently scouring the entire globe to bring in new members for The Bullet Club, as the OGs plan on taking the faction back to its old roots. A few weeks ago, Tama and Loa asked the fans on Twitter to suggest the very best names that they feel should join The Bullet Club and according to recent acclamations from The Bad Boy, he also seemingly remains pretty interested in bringing in former WWE Cruiserweight Champion Neville to The Bullet Club Firing Squad. Damn @TangaloaNJPW , I thought you were playin. Last night, Tama Tonga once again took it to his social media and noted that he and his brother are scouting the Independent Circuit, before eventually making their way to last night's WWE Live Event in Sanford, Florida. As of right now, fans should definitely not expect any current WWE superstars jump ship to NJPW and join The Bullet Club. But, it remains pretty interesting to be seen, which superstar eventually gets the nod and finally joins The Bullet Club Firing Squad in their on-going war with The Bullet Club Elite.